If you or someone you know has expressed an interest in learning how to fly fish, Unicoi Outfitters is teaming up with Orvis and Trout Unlimited to offer free introductory lessons every Saturday in July from 9 AM until 12 noon. We'll have casting lessons as well as sessions on how to properly rig your fly rod all morning long with qualified teachers from the Unicoi professional staff as well as local Trout Unlimited members. 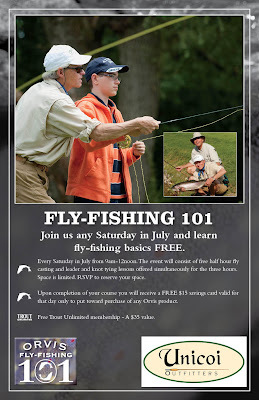 Participants will not only get an introduction to fly fishing but will also receive a $15.00 gift certificate good toward the purchase of any Orvis products plus they'll receive a one year trial membership (new members only) in Trout Unlimited, the country's foremost cold water conservation organization. We encourage you to please call ahead and sign up for these sessions if possible. The number in Helen is 706-878-3083 and the number in Blue Ridge is 706-632-1880. We look forward to having you join us.